Brussels (24 April, 2018) – TrustLaw, the Thomson Reuters Foundation’s global pro bono service and IGLYO, the International Lesbian, Gay, Bisexual, Transgender Queer & Intersex (LGBTQI) Youth & Student Organisation launch, ‘Expression Abridged: Legal Analysis of Anti-LGBT Propaganda Laws’ today. The report discusses in detail the various legislations aimed at banning LGBT ‘propaganda’ to minors which have been enacted or proposed in Belarus, Kyrgyzstan, Kazakhstan, Latvia, Lithuania, Moldova, Poland, Russia and Ukraine. It aims to provide a thorough analysis of legal arguments in support of passing such laws and whether they come into conflict with other national legislation and international treaties and conventions to which these countries are party. The report clearly describes why many of these arguments cannot and should not be used in the context of passing legislation that restricts the rights of all citizens, including children, to access correct and relevant information and to freedom of expression, among others. In this way and in many others, the report will help support human rights NGOs in Europe, Central Asia, and beyond to fight against these propaganda laws and to challenge the growing discourse around traditional gender and family roles. 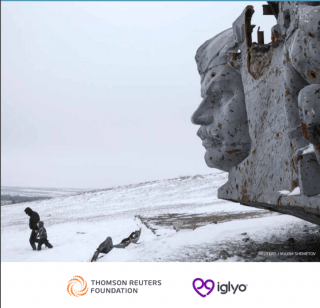 In 2016, TrustLaw connected IGLYO with a pro bono legal team to create a new advocacy resource for LGBTQI, children’s and human rights organisations on proposed and enforced anti-LGBT propaganda laws. The launch event will be co-hosted by Linnea Engstrom MEP, Heidi Hautala Vice President of the European Parliament, IGLYO, and the Thomson Reuters Foundation at the European Parliament in Brussels. The full report will be available here soon.